Marine Corps Leadership Principles - Being in the marine, you will be able to learn a lot of things, and one of them is leadership. The marine has been well-known as one of the defense departments of the country that is able to show a great deal of leadership skills to its every member. Using the Eleven Principles of the Marine Corps, every member of the marine is taught and practices every day so that after the training, they will be able to have their own guide to take action when they are with their units. These principles are also expected to be able to provide every marine with a good sense of direction throughout his or her career. 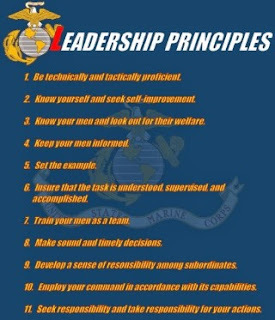 However, due to this limited time and space that we have, we are not going to cover all of the mentioned Eleven Principles of the Marine Corps. Rather, we are going to provide you three of the most important principles that you should know about the Marine’s leadership. One thing that you need to remember is that these leadership principles are different from the leadership traits. The first principle of the Eleven Principles of the Marine Corps is being technically and tactically proficient. being proficient is using all of the tools that are provided and are in front of you of the moment is very important, especially when you are in the battle field. If you are able to keep a high level of competence in your position, your marines will give a big respect to you. In addition, you will be able to lead a battle well. The next principle of the Eleven Principles of the Marine Corps includes being able to know yourself and being able to seek improvement for yourself. When you look at yourself, you have to be able to find out what needs to improve and what needs to be maintained. When you find that there is something that you need to improve yourself, you should be able to find the way to improve that. You can do it your own, or you can seek some help from the people around you. In addition to that, as a leader, you should also know about your team after you know about yourself. The last principle in this article about Eleven Principles of the Marine Corps is knowing the member of your team and make sure that they have received their welfare. This principle shows how you, as a leader, can bring good to the people who are below you.